there is a link missing to a correct page. Could you please correct for being able to evaluate the ARMs sample for web application? Great tool and thanks a lot! In Xafari x06 we have created special template XafariDefaultTemplateContent for web application. For using ARMs you should add XafariDefaultTemplateContent to your application (see attached file XafariTemplate.png) and since version x06 you don’t have to add any custom code in this template. We are going to fix documentation soon. Thank you for using Xafari. 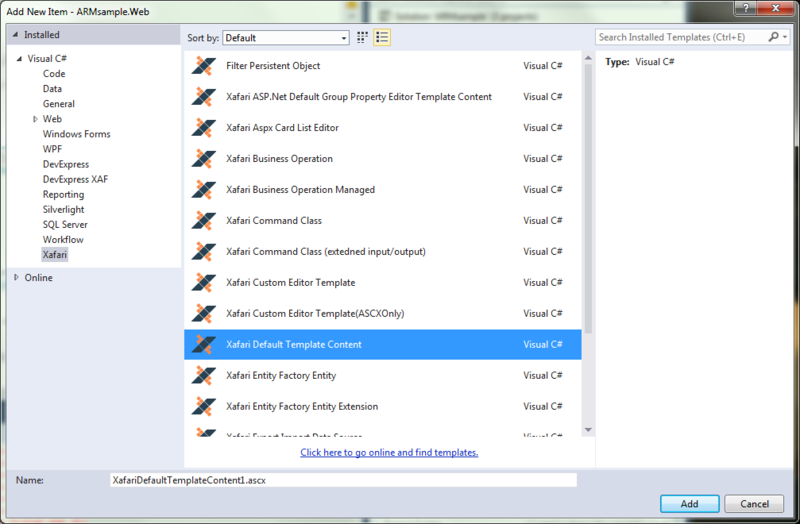 Unfortunately if i try to add a new item I can't see a template folder called "Xafari" containing XafariDefaultTemplateContent as shown in the attachment. I reinstalled Xafari and installed Xafari VS Toolbox as well. Can you please tell me how to get the templates? We are going to release new build of Xafari 14.2.5.x tomorrow 4 March. All templates will be added in this build. Perfect, thanks a lot dear Sasha! With the new version 14.2.5.x now I'm able to see the templates !